Hybrid Racing Monoblock Fuel Pressure Regulator UNIVERSAL - Dezod Motorsports Inc - Home of the automotive performance enthusiast since 2002. The fuel pressure regulator is an often overlooked, but very critical component in a vehicle’s fuel system. Without a reliable and consistent fuel pressure, your ECU has no way of knowing how much fuel it is injecting into each cylinder. Most conventional fuel pressure regulators use a bladder-type design. Although the bladder-type design is cost-effective and reacts to disturbances quickly, those bladders often lead to significant pressure fluctuations, which are manifested as a bouncing needle on your pressure gauge. 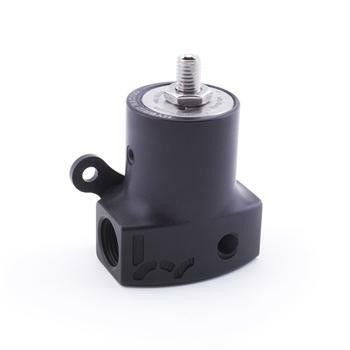 The Hybrid Racing fuel pressure regulator features a piston-type design that introduces damping into the regulator to reduce pressure fluctuations and needle bounce, giving you a more stable and reliable fuel pressure. Constructed from aircraft grade 6061-T6 aluminum and 304 stainless steel, each regulator receives durable Teflon impregnated, hard anodized finish and redundant seal quad o-rings for improved performance and longevity. The end-product is a regulator that keeps your fuel pressure consistent, and looks good doing it. Each regulator comes supplied with all of the fittings you’ll need to hook up either a return or return less fuel system with -6 AN lines. The regulator can accept up to -8AN lines, but you will need to purchase (2) -8AN/-8ORB unions to attach the -8AN lines.